We all know fear. We’ve come up short as the fear of rejection stopped us from being vulnerable with someone, or stopped us from creating a relationship, or stopped us from sharing ourselves or an idea. We’ve known the fear of failure as we’ve contemplated doing something risky and then done an about-face as the wash of “what-if-it doesn’t-work” engulfs us. Fear of failure, fear of the unknown, fear of rejection are internally generated. These fears come from evolution –based circumstances. A need to be part of a community (so not wanting to alienate others), a need to know outcomes (fear of the unknown), a need to survive. Fear of the dark stems from being in a space where our senses cannot inform us of what is around us. It’s very natural to fear not-knowing. Fear is a big part of the human experience, but facing fear is the only way through it. Stay tuned for a head-on tackle of this all too familiar topic. In order to manage fear and to gauge which actions we will take and which ones we won’t, we ask “What If” questions. What if I try this and I fail? What if it doesn’t work? What if I make a decision and in a few years I’m not happy? What if people think I’m stupid, or if I ruin my reputation? What if my idea is too elementary? What if I get told no? What if I get hurt? It’s normal to ask these questions. It’s how we gauge risk. But there is a point where these questions quit serving us and they simply hold us back, paralyze us, keep us small. Here are a few other questions to ask yourself after you’ve listened to all the self-preservation questions: What IF it didn’t work out? Does the world really end? Would I regret the courage and adventure of trying for this, of attempting to live bigger, of loving and risking for the life with the most potential? What if it DID work out? What adventures might I find along the way? What will I learn as I let myself focus on success instead of fear? What’s really possible if I chose courage and possibility instead of fear? Do I want to still be who I am and where I am now, five years from now? Well, with my typical inability to bottle my thoughts and emotions, that night I faced the fears in order to be true to what I felt like I could reasonably do. At first, I think Lydia thought I was joking around, but I finally said, “You know, I do nature differently than you do. You guys are incredible athletes and you put your head down and you challenge the mountain and you cruise through it. I like to BE in it. I like to sit by the lakes and spend time writing and meditating in the trees. I like to go at a pace that allows me to lift my eyes off the rocky trail and see what I’m hiking through. I want to set up a base camp. We had a group prayer before bed and I told them all I loved them, and then I crawled into my tent. I tossed and turned a lot of the night trying to decide if I dared actually break away from these beautiful people I had come to spend the week with. I didn’t want to. I didn’t want to miss this opportunity to spend days and nights in the mountains with them. I wanted time with each of them, but I knew my limitations. In the morning Marty approached me, in his thoughtful way and tried to make it sound as if I’d be doing him a favor if I could stay with a base group of others who weren’t wanting to tackle the aggressive schedule either. As it turned out we broke into two groups. A group of 5 headed off over the passes and pumped out 50 miles over the next 4 days, and my group put in 20 miles and 4000 feet of elevation gain. As we parted ways that day I said to Marty, “Everything is turning out exactly as it’s supposed to.” That was my consolatory comment as I broke up the group he’d so carefully put together. I didn’t know that the “supposed to” was going to look like, but I knew that facing my fears, my limitations, providing a space for others to enjoy the different way of experiencing the trip felt like the right thing to do. And was it ever!! What we got was time swimming in 3 different lakes – Aneroid, Wallowa, and a small pond along the trail; a night sitting under the eve of a cabin during a thunderstorm watching the lightning while our friends were backpacking their way over the passes and sloshing through the storm; we played cards and met Dennis the groundskeeper, who managed a collection of 100-year-old rustic cabins up around the lake. We talked and laughed and hiked, and in the end, four people who hadn’t known one another before the trip were the best of friends. Like family. We had time to really get to know one another in a way we certainly would not have with the dilution of the larger group. I tell this story, to illustrate my personal fears that popped up. Was my reputation damaged? Did I disappoint others in the group? I don’t know the answers to those questions. I think perhaps, a little, but by facing those fears instead of letting them dictate and push me into a space I was not comfortable in, the right things happened. It was interesting to watch the wonderful serendipity that accompanied our group. Megan had brought a sleeping bag that wasn’t warm enough for the 32 degree nights. She started throwing out the idea of finding another camper and buying a blanket off them. Then Dennis shows up – in the rainstorm he offered us shelter and when she broached the subject of buying a blanket from him later he gave us 3 big wool blankets we could use during the cold night at higher elevation, and then return them to him so it was not a weight added to the pack – best possible scenario. In order to keep Megan warm Ethan and I crowded 3 people into her two-person tent, which turned out perfect because the elastic in my tent poles was shot and my tent had to be Jimmy rigged into a claustrophobic low rider that wasn’t fun for anything but laying flat on your back. Dan’s decision, the fourth member in our party, to join us was perfect because his sense of humor and easy-going nature, his connection with Megan and appreciation of Ethan made the group dynamic exactly what it needed to be. I had time alone with Megan to conduct an interview with her for this podcast and we were able to talk about her attempted suicide and her story leading up to those events in her life. We sang at the top of our lungs as we drove home. We laughed and ordered pizza and found suckers with scorpions, which was apparently on Ethan’s bucket list. In short – it was exactly what it needed to be and it was made possible because I faced my fears of social rejection through the damage of my reputation, and as it turned out, facing my fear of upsetting others because I had a desire to take a different approach to our situation was instead met with others who also appreciated the opportunity to take my desired approach. If I had let the fears dictate my direction, an entirely different experience would have unfolded. If you are living a life that is not fulfilling, a life dead with boredom, a story where the possibilities for rich passionate living have been left in the past, on the table, lost in the recesses of a younger you, or maybe your life just needs a bit of an update or you want a relationship you don’t have or to learn something new. Your choice is to either stay in the comfort zone that has brought you to your current space or to manage the questions and fears that keep you creating what you are creating. Events themselves only hold the power we give them. Even the information our senses bring to us do not have meaning in and of themselves, they are information that we then give meaning to. We are the meaning creators. That means we also have the capability to shift the meanings that we are giving our fears. Fear of failure is a projection of events into the future. What if the projection was one of success instead? Let me share a couple of things to consider as we discuss overcoming the fear of failure. Realize that the journey and the courage for the journey is the beauty of creating – and you get to do it your way. The mindset focused on success is far more likely to succeed than that the mindset based on fear. Get excited about the things that you want to add to your life, that are just out of reach because of your fear, and push through because you want that passion, you want that stretch, you want to try all the things that YOUR soul yearns for before you leave this life. Get excited about that rich and thrilling possibility. Start picturing the success. Consider inaction. If you were the exact same person you are today, in five years, would you be happy with that? If not, action is required. Faith is the opposite of fear. Fear is of the devil to stop us. Faith is the power to envision, believe and create – a literal power. Which do you choose? So, here’s an example of a hero move – a woman named Christine Lavulo shares her story of running up against fear in her career and how she dealt with it. Listen to the audio recording to hear Christine’s story. There is a story I will end with. It’s called The Giant. Shortly thereafter the voice of the giant rang through the village and the woman stepped out to meet him. She looked out across the clearing to the edge of the forest at the foothills of the mountain. Sure enough, there stood an enormous giant! For a moment, she just stood and stared at him from a distance. There was a gentle rise in the ground separating the two, so she could only see him from the waist up. It was difficult to tell exactly how big he was, but he was clearly taller than any man she had ever seen or heard of. She was struck with the same awe and terror all of her predecessors surely felt at that moment. The giant was real. Facing him today she would surely die. She considered running back inside the castle walls, but she had given her word to the people to face their giant, so with all the bravery she could muster she began to walk tentatively toward the giant. And, the giant began to walk toward her. After a few paces up the gentle incline, she gained a full line of sight to the giant and she could see his whole form. With the better angle, she could tell he was not nearly the 10 feet in height she first believed but was perhaps only 7-feet-tall. He was still massive, but at least now in human proportions. She was still no match for him, but at least she would meet her defeat at the hands of something recognizable. With that element of the unknown removed, she was able to walk at a normal pace and after a few more steps the giant appeared to be smaller still. Was this some strange optical illusion? The giant appeared to be not much bigger than she was now. She might actually have a chance! With this new hope, her pace quickened. And with every step, she could tell it was no illusion. The giant was actually shrinking before her very eyes and the faster she ran, the faster the giant shrank. Her terror had turned to hope, and now that hope and turned to confidence. Certain of her victory, she was now in an all-out sprint toward the giant. As she reached the middle of the clearing she stopped and stood toe-to-toe with the “giant” who was now only 12 inches tall and still shrinking. She reached down and picked him up in the palm of her hand. She only had time to ask one question before he disappeared. “Who are you?” she said. 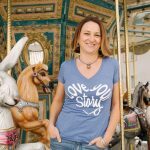 When I started the Love Your Story podcast there was fear of many things. Fear of being thought pedantic, fear of failure, fear of rejection, fear of vulnerability and sharing too much, fear of telling my own story, fear of wasting time and money. I still feel fear when I create something new. When I created the 21 Challenges I feared no one would sign up. When I create classes and tools I fear no one will want them. As I create the retreat coming up in January 2019 I face the fear that no one will sign up. In hindsight, I rejoice that I faced and overcame each fear – that I pushed past them because of what I have created, because of the people who have been on this path with me, because of who I am now vs. who I was then. The giant is so small now around so many things I have to look back and remember oh ya, I WAS afraid. This past weekend I was at a rappelling event and I watched a woman who had never rappelled face her fear. The going was VERY slow as she let herself off the cliff and the rap down was inch by inch, but once the fear was faced the giant was smaller. Her second time down was twice as fast and her anxiety was significantly reduced. One step at a time we move forward. One step at a time the giant shrinks. Take the step before you – just one step at a time. Take Action! We all make mistakes – lots of them, that’s part of the game. Don’t let the fear of not hitting the home run stop you from getting in the game. If you don’t step up to bat you are just gonna sit on the sidelines, and that’s not much of a story. Everyone who ever learned how to walk fell down over and over again. Everyone who learned to play an instrument has hit a thousand wrong notes. Everyone who learned to play a sport missed lots of shots. We don’t ever learn something new without making mistakes, they are a fact of life. 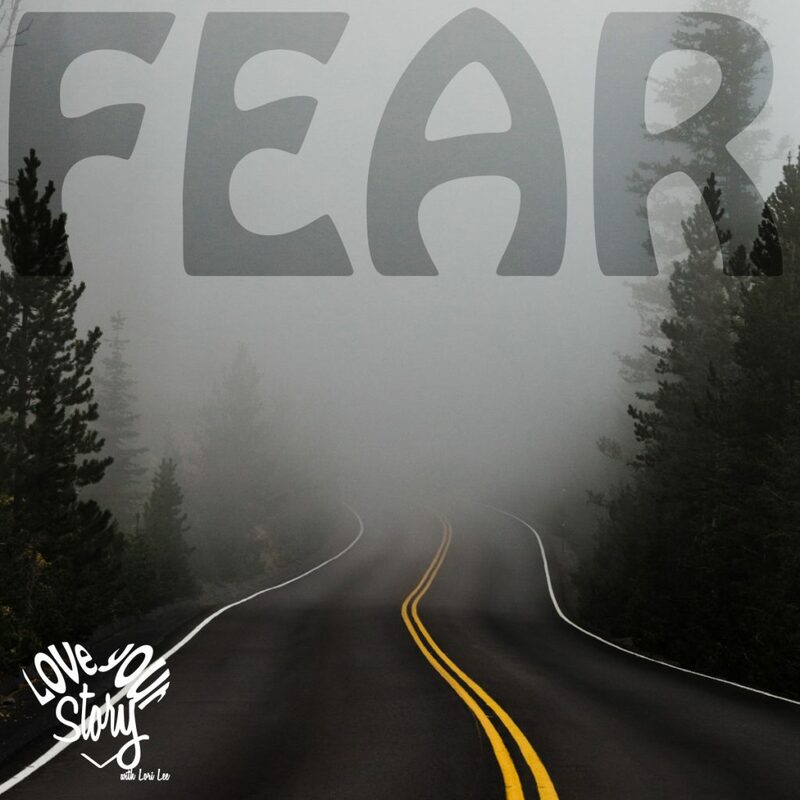 So, when the fear boils up in you – the fear of making a mistake, the fear of rejection, the fear of failure, just remember that facing the fear is what will make it smaller, facing the fear is the only way to go, learn, be or do anything that sits on the other side of the block, and that may be exactly what you need is found on the other side of that fear. Courage creates possibility – and one hell of a better story. Thanks for being with me. Your challenge for the week is to find one thing you’re afraid of, just one thing, and do it! It becomes easier with practice. The more you face your fears, the smaller they get. Go face one. It’s what heroes do. Don’t forget to leave us a review on iTunes, Apple Podcasts, or wherever you listen to your podcasts, if you like the podcast, and share it with a friend. The more people who listen the more good these ideas can do. Share the love people.